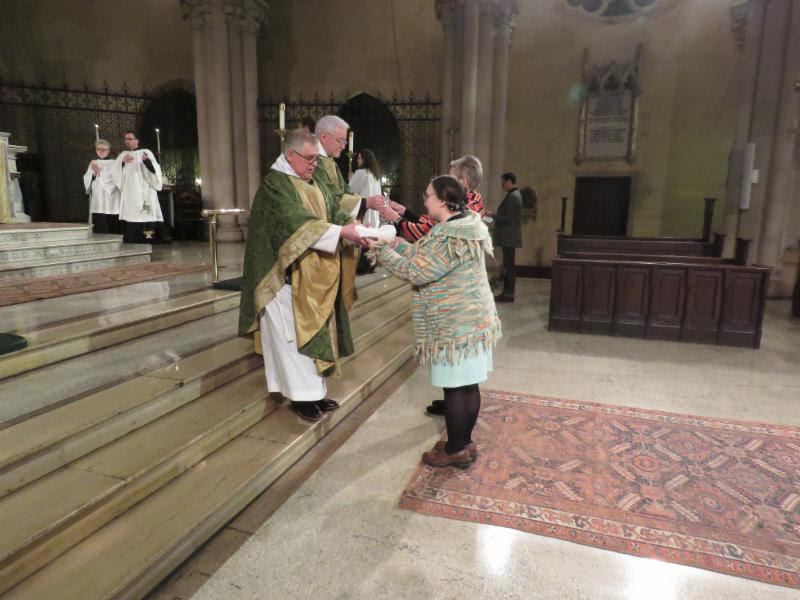 The Reverend Park McDermit Bodie was celebrant and preacher for the Solemn Mass on the Third Sunday after the Epiphany, January 27, 2019. Father Matthew Mead, now rector of the Parish of Christ and the Redeemer, Pelham, when he served here from 2004 until 2009, shared my conviction that we should not omit any of the New Testament at the Daily Office. He gets credit for starting, and really completing, what we call the "Saint Mary's Lectionary Project." There are lessons in easily legible 22-pt. Garamond for every service we celebrate. Over the years pronunciation guides have been added to the texts. Recently, I began to footnote any text that we've lengthened, explaining the reason for the lengthening. (The Prayer Book lectionaries permit the lengthening, but not the shortening, of texts "at discretion" [BCP 888, 934]). When questions of what constitutes Christian marriage began to be raised in recent years, I began to pay new attention to marriage in the Old Testament. A lot of significant material is omitted from the Eucharistic and Daily Office lectionaries--so we take advantage of the permission to lengthen lessons. Beginning on Tuesday of the coming week, the lessons from Genesis are reordered through Sunday so that we can hear a number of omitted stories. The first of these is Genesis 20:1-18, the story of Abraham and Sarah in Gerar. MaryJane Boland was the reader. The New Oxford Annotated Revised New Revised Standard Version With The Apocrypha (2010) calls Genesis 20:1-18, "The second story of endangerment of the matriarch" (Abraham's wife Sarah). What this edition of the Bible calls the "First story of endangerment of the matriarch" (Genesis 12:10-13:1) is included in the lectionary. In that story Abram and Sarai are not yet Abraham and Sarah. There is famine; they go to Egypt. Abram is worried that the Egyptians will kill him so they can take his wife, Sarai, from him. He tells her, "Say you are my sister, so that it may go well with me because of you, and that my life may be spared on your account" (Genesis 12:13). So, Pharaoh takes her as his wife. He makes Abram rich. Plagues, however, arrive. Genesis does not tell us how Pharaoh learns that Sarai is Abram's wife; but he sends them both away with all of Abram's newly acquired riches. The second time Abram does this same thing, he has become Abraham, and Sarai is now Sarah. It happens with another ruler, Abimelech. In this story Abraham claims that Sarah is "indeed my sister, the daughter of my father but not the daughter of my mother; and she became my wife" (20:12). Scholars wonder whether she really was his half-sister or if this just another of Abraham's lies to protect himself. Later in Genesis, their son Isaac will repeat his father's behavior with his wife, Rebekah (Genesis 26:7-11)--a passage also omitted by the lectionary, but which we will hear read in due course. The lectionary also omits Genesis 25:1-18, the story of Abraham's second wife, his death and burial by Isaac and Ishmael, and an overview of Ishmael's descendants, whose sons are called "princes" (25:16). Gospel Procession: Thurifer Rick Miranda, Acolytes Luis Reyes (L) and Marie Postlewate, MC Marie Rosseels, and Crucifer Brendon Hunter (who will hold the book for the gospeller), and Father Jim Pace. Abraham and Sarah's marriage was one of many different types of biblical marriage that doesn't get much publicity--and because of a new standard for employees would now disqualify Abraham and Sarah from working for the American Bible Society (ABS). One notes that in its new policy, ABS avoids making Jesus' words about the remarriage of divorced persons (Mark 10:11-12; Matthew 5:31-32; Luke 16:18) a standard for their employees. YOUR PRAYERS ARE ASKED FOR Lars, Yaroslav, Linda, José, Henry, Dorothy, Dennis, Paula, John, Alexandra, Kyle, Carolyn, Ivy, Jondan, Eloise, Michael, James, Karen, Susan, Marilouise, Abraham, May, Takeem, David, Sandy; Aidan, RELIGIOUS; Horace, Daniel, Gaylord, Louis, and Edgar, PRIESTS; all the benefactors and friends of this parish; and for the repose of the soul of Frederic Bradford Burnham, PRIEST. GRANT THEM PEACE . . . February 3: 1884 Mary Stephanie Butterfield; 1886 Mary Garrettena Fiske; 1888 Daniel S. Dickinson Mygott; 1891 Mary Coddington; 1904 John Townsend Willis; 1923 Maria Rebecca Willis; 1924 Mary Wilhelmina Herman Neuspickel; 1944 Julius Rodriguez Amoros; 1983 Chaney Van Buren; John Alexander Ellis Steele. At the Preparation the ushers present the congregation's gifts of bread, wine, and money. THIS WEEK AT SAINT MARY'S . . . Sunday, February 3, The Fourth Sunday after the Epiphany, Sung Matins 8:30 AM, Mass 9:00 & 10:00 AM, Adult Education 10:00 AM, Solemn Mass 11:00 AM, Solemn Evensong and Benediction 5:00 PM . . . Wednesday, February 6, Sung Mass 12:10 PM; Wednesday Night Bible Study Class 6:30 PM in Saint Benedict's Study. . . Thursday, February 7, Mass with Healing Service 12:10 PM . . . Friday, February 8, Centering Prayer 6:30-8:00 PM, Atrium, Parish House, 145 West 46th Street. THE BLESSING OF THROATS . . . February 3 is the day on which we commemorate Saint Blase (sometimes spelled Blaise), fourth-century Armenian bishop and martyr. In the Saint Mary's calendar, Blase now shares February 3 with Saint Anskar, ninth-century bishop and missionary in the Nordic lands. Saint Blase is considered by some to be the patron saint of drapers, builders, and veterinarians. But he is most often invoked for protection against injuries to, and diseases of, the throat. This year February 3 falls on a Sunday. However, this coming Sunday we will still offer the blessing of throats after the Solemn Mass and at the end of Evensong and Benediction. WE LOOK FORWARD TO RECEIVING YOUR PLEDGE CARD! . . . If you have not yet completed a pledge card for 2019, we encourage you to do so as soon as possible. Our needs are urgent. Our mission is clear. We welcome your support, and we are grateful to all those have supported Saint Mary's so generously in the past . . . Our campaign and pledge drive continues. Once again this year, our goal for the campaign is $425,000. As of January 30, 2019, we have received $356,483.00 in pledges from 105 households, 84% of our goal. Father Jay Smith (L) and Father Matt Jacobson, were concelebrants. HOSPITALITY MINISTRY AT SAINT MARY'S . . . We hope to receive donations to help pay for the holy-day receptions on March 25 (Annunciation), April 20 (Easter Eve), and Thursday, May 30 (Ascension Day). If you would like to make a donation, please contact the parish office. The total cost of each reception is around $500.00. We appreciate all donations in support of this important ministry. Any and all donations are always used to make up the deficit each year we normally experience in the hospitality budget. When making a donation, please make a note that it is for the Hospitality Ministry, and we thank you. AROUND THE PARISH . . . Saint Mary's AED (Automated External Defibrillator) lives in the sextons' lodge, off the narthex, at the Forty-sixth Street entrance to the church. It is to be used should someone experience sudden cardiac arrest. It is a device that can save lives, since it makes it possible to provide immediate emergency assistance while waiting for emergency medical technicians (EMTs) to arrive. Our certification for the use of the AED is about to expire. A number of parishioners and members of the staff have been trained to use the AED. If you would like to attend a half-day refresher course and renew your certification, thus allowing Saint Mary's to receive recertification please contact Chris Howatt in the parish office . . . Br. Damien Joseph SSF and Brother Thomas SSF are attending the annual conference of the Living Stones Partnership in Phoenix, Arizona. They return to the parish on Tuesday, February 5 . . . Attendance: Last Sunday 176. FROM THE MUSIC DIRECTOR . . . The setting of the Mass on Sunday morning is by Stefano Bernardi (c. 1577-1637). Bernardi, musician and priest, was maestro di cappella at the cathedral in Verona, the city of his birth, from 1611 to 1622. In 1624, he became director of court music for Paris von Lodron, Prince-Bishop of Salzburg, where he remained for the next ten years and was active in the musical life of Salzburg Cathedral. Notably, Bernardi composed a Te Deum for twelve choirs, unfortunately now lost, for the Cathedral's consecration in 1628. During his Salzburg years, Bernardi was ordained to the priesthood and also received a doctorate in canon and civil law. Bernardi was one of the significant Italian composers working at the juncture of late Renaissance polyphonic and early Baroque concertato styles. His Missa Praeparate corda vestra takes its inspiration from a responsory which, translated, begins "Prepare your hearts for the Lord and serve Him only" (1 Samuel 7:3). The Mass is compact in its construction and is scored for four voices. Each movement begins with a recognizable common melodic phrase derived from the source motet. (c. 1528-1601). His musical career included significant choral direction positions in Mantua, Rome, Concordia, Fano, Ferrara, Piacenza, and Gualtieri. He is remembered as one of the earliest composers substantially to utilize the emerging figured bass technique which was one of the markers of the transition from Renaissance to baroque compositional style. Viadana's Exsultate justi, one of his best-known motets, is a setting of Psalm 33:1-3 in da capo form. The matching outer sections are chordal and in a dancing triple meter suggestive of rejoicing. The central section is in a statelier duple meter and alternates chordal and polyphonic writing. The flowers were given to the Glory of God by Carlos Mejia in thanksgiving for the Lord's continual care for him and for his family. CHRISTIAN EDUCATION . . . On February 3, John Basil, former artistic director of the American Globe Theater, concludes his four-part series on William Shakespeare, focusing on Hamlet. The series is designed to help us read Shakespeare's language, while looking at some of Shakespeare's humanist and religious concerns. John writes, "This will be an introduction to William Shakespeare's first folio and will provide an approach to the text using methods that Shakespeare and his company utilized. The participant will learn how to uncover the character's physical life from the language. This gutsy, visceral way to analyze Shakespeare's language teaches the participant how to use the script as a 'blueprint.' The Tragedy of Hamlet will be the text explored. We will also hope to uncover all of the Protestant and Catholic references that are hidden in the text." . . . On Sunday, February 10, parishioner Mary Robison will make a presentation to the class on an important archival project here at the parish. Mary writes, "On February 10, we'll look at Saint Mary's history through its publications, The Arrow (1891-1899) and Ave (1932-2004), now digitized and available for research. What can these documents tell us about our parish and its rectors, from the Gilded Age through World War II? I'll talk about why these publications existed, and discuss how they're useful for research. I'll also mention some of the interesting things I found-the more things change, the more they stay the same! . . . On Sunday, February 17 and 24, Father Borja Vilallonga will lead the class in a discussion of his doctoral research done at the Sorbonne. Father Vilallonga was ordained in the Roman Catholic Church and is now a priest in the Old Catholic Church, which is in full communion with the Episcopal Church. He is currently a postdoctoral fellow at Columbia University, working with Prof. Carmela Vircillo, a great friend of Saint Mary's, who recommended us to Father Vilallonga. His research is centered on nineteenth- and early-twentieth-century European Christianity-the Oxford Movement, Gallicanism, early liturgical reform, Pius IX, the First Vatican Council, and the transformation of Roman Catholicism between Vatican I and Vatican II . . . The Wednesday Night Bible Study Class, led by Father Jay Smith, will meet on February 6 at 6:30 PM in Saint Benedict's Study. Ushers Thomas Heffernan and Jennifer Stevens. Servers and ushers receive Communion after the congregation receives. AROUND THE DIOCESE . . . At Saint Paul's Chapel, 209 Broadway, Tuesday, February 5, 7:00-9:00 PM, Book Talk: Frederick Douglass: Prophet of Freedom. Trinity Church, Wall Street, is hosting a free book talk with David Blight, author of Frederick Douglass: Prophet of Freedom Join the Reverend Phillip Jackson, vicar, Trinity Church, Wall Street, as he hosts a Q&A with David Blight, followed by a reception and book signing. This is one of the author's only public appearances in New York City. Douglass spent his life working to extinguish racial divisions. He lived to see black emancipation as well as the age of lynching and Jim Crow laws. As one of the greatest orators and writers in American history, Douglass has much to teach us about how he used his powerful voice to challenge inequality. AT THE GALLERIES . . . At the Metropolitan Museum, Fifth Avenue and Eighty-second Street, until October 2, 2019, The Art of Native America: The Charles and Valerie Diker Collection. This landmark exhibition in the Museum's American Wing showcases 116 masterworks representing the achievements of artists from more than fifty cultures across North America. Ranging in date from the second to the early twentieth century, the diverse works are promised gifts, donations, and loans to The Met from the pioneering collectors Charles and Valerie Diker. Long considered to be the most significant holdings of historical Native American art in private hands, the Diker Collection has particular strengths in sculpture from British Columbia and Alaska, California baskets, pottery from southwestern pueblos, Plains drawings and regalia, and rare accessories from the eastern Woodlands.